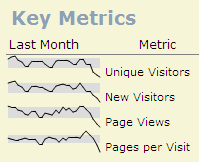 Every month, I present web site metrics to our Web Steering committee. Since this month’s meeting fell on April 1, I took the opportunity to mock up and present a set of fake charts showing all of our key metrics falling off a cliff. OK I know what you’re thinking — not as funny as cling wrap on a toilet seat. You’re right but chart pranks are more cerebral . . .